Edna G. Bensen, 98, of Staten Island, NY, peacefully passed away March 13th at Sunrise Assisted Living surrounded by her loving family. She was born January 4, 1919 in Brooklyn, daughter of the late Martin & Karen Blomquist. Edna led a very active life. She enjoyed being at and working with her late husband, Arthur Bensen at Frontier Town in the Adirondack mountains of New York. During her early days, she enjoyed waterskiing and horseback riding. She also was fond of sewing and knitting. 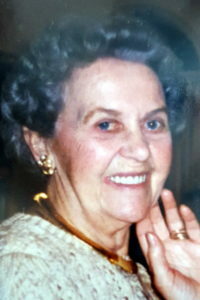 Edna leaves to cherish her memory, her beloved nephews, Bernie Blomquist and George Blomquist; Adored nieces, Karen Kline and Barbara Bushby as well as several great nieces and nephews. Edna will be deeply missed. Arrangements held at Cherubini McInerney Funeral Home in Staten Island. A graveside service will be held on Saturday at 11:45am at Oceanview Cemetery. Just learned of Edna’s passing. So very sorry ! I was very close to Art when he owned FT. Then I got to know Edna, she was a wonderful and spiritual person.